Back(l-r): Ira Hillyard, Unknown, Bob Johnson, Junior Petterborg, Irwin Jonas, Unknown, Unknown. 2nd from Back: Unknown, Ruth Rich, Kaye Funk, Anna Lawrence, Joyce Larsen, Ruth Hutchinson, Nadine Johnson, Darrel Smith. Middle Row: Unknown, Unknown, Eva Kershaw, Lyle Wilding, Unknown, Afton Sorensen, Dorothy Nielson, Unknown, Norwood Jonas. 2nd from Front: Alvin Spackman, Bernice Frandsen, Unknown, Glacus Merrill, Joy Erickson, Unknown, Allen Spackman. Front: Garr Christensen, Oral Ballam Jr, LaMar Carlson, Unknown, Gail Spackman, Ivan Anderson, Warren Hamp. 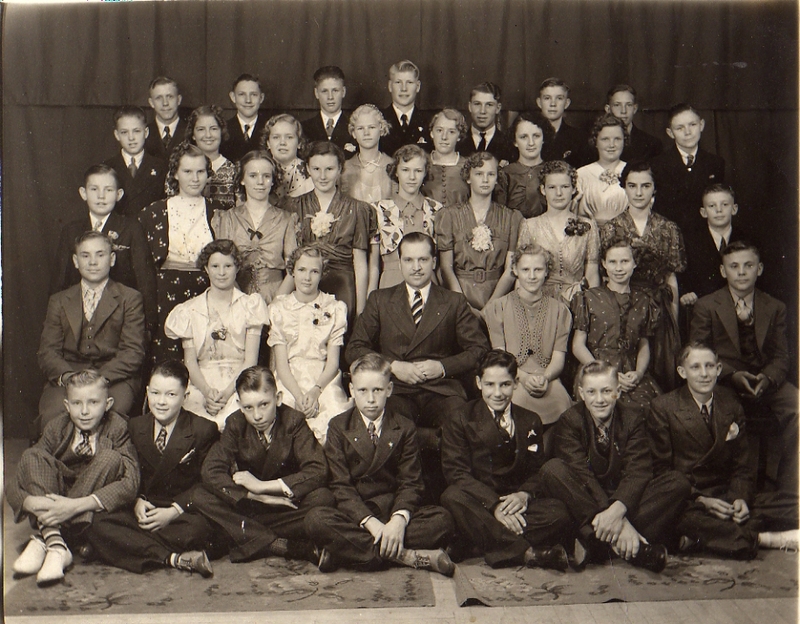 This is Glacus Merrill’s class from what I believe is 1936. He taught class at Park School in Richmond, Cache, Utah. Several individuals have assisted me to name the individuals I have so far. There are too many unknowns that I hope to clarify in the future. If anyone can help, I would certainly appreciate it. My Grandfather, Norwood, and his brother, Irwin, are both in the photo. Irwin died in World War II, and I assume some of the rest did as well. I have listed all the individuals below with some limited information I could find on them. At the very bottom is Glacus’ obituary. Here is a copy of the obituary I found for Glacus. Wow, I wish my school teachers had been this amazing. LOGAN – Glacus G. Merrill, 96, died of causes incident to age in Logan, Utah on Saturday, February 9, 2002. He was born May 27, 1905 in Richmond, Utah to Hyrum Willard and Bessie Cluff Merrill. He is a grandson of Marriner W. Merrill, a pioneer prominent in the settling of Cache Valley, an Apostle of the Lord Jesus Christ, and the first president of the Logan LDS Temple. He married Constance B. Bernhisel in 1925, and they were later divorced. He married Marie B. Bailey, March 24, 1945 in Washington D.C. Their marriage was later solemnized in the Logan LDS Temple. While attending school, he participated in track and football at North Cache and Brigham Young College, where he graduated in 1925. Glacus graduated from Utah State University in 1935 and also attended the University of Utah and Chico State College in California. He is a graduate of the REI Radio Engineering School in Sarasota, Florida. He was the principal of the Richmond Park School for 11 years and served in the U.S. Navy for four years during World War II. He served an LDS mission to California from 1954-1955. While living in the East, he served as President of the West Virginia Farm Bureau and the State Black Angus Association. He is an honorary Kentucky Colonel. He also served as President and District Governor of Lions Clubs in Utah and West Virginia, and was a member of the Lions Club for 42 years. Glacus was Vice President of the West Virginia Broadcasters Association, and is a member of the USU Old Main Society. He established a Scholarship Fund in the Communications Department at USU. The Montpelier, Idaho Jaycees presented him with their outstanding Citizen’s Award. He was also a member of the Montpelier Rotary Club, Utah Farm Bureau, VFW and American Legion. He is a member of the “Around the World Club” having traveled around the world with his son, Gregory. He and his wife, Marie traveled extensively. Merrill was a popular Rodeo announcer in his early days. He authored the book “Up From the Hills” which was finished in 1988 and is available in area libraries. Honored by the Utah Broadcasters as a pioneer in Radio Broadcasting, Merrill started his broadcasting career in 1938 as part owner and Program Director at KVNU Radio in Logan. After serving four years in the Navy, he built his first radio station Clarksburg, West Virginia. He owned and operated 11 other stations in West Virginia, Ohio, Maryland, Idaho and Utah, including stations in Montpelier, Idaho and Logan, Utah. He was well known for his frank and outspoken editorials, news and comments on KBLW in Logan. He has given over 7,000 newscasts and editorials always ending them with the saying, “Have Good Day Neighbor.” In 56 years of radio broadcasting, he trained several young broadcasters who are now making good. As a hobby, wherever he lived, he operated a cattle ranch and farm. He served in many civic and church activities including counselor in the LDS Stake MIA, counselor in the East Central Stake Mission Presidency, 5 years as a Branch President and 11 years as District President in West Virginia. He also served as Deputy Scout Commissioner in Idaho and for 12 years taught the High Priest Class in the Logan 3rd Ward and served for several years as the High Priest Group Leader. He was an avid supporter of many missionaries in the area. His wife, Marie preceded him in death on April 22, 1993, as well as six brothers and one sister. He is survived by his two daughters, Darla D. (Mrs. Dennis Clark) of Logan; Madge (Mrs. Melvin Meyer) of Smithfield; one son, G. Gregory (Joan) Merrill of Logan; nine grandchildren, 22 great-grandchildren and 10 great-great-grandchildren. Funeral services will be held at 12 Noon on Thursday, February 14, 2002, at the Logan 3rd Ward Chapel, 250 North 400 West, with Bishop Grant Carling conducting. Friends and family may call Wednesday evening, February 13th, at the Nelson Funeral Home, 162 East 400 Norther, Logan from 6 to 8 p.m. and on Thursday at the church from 10:30 to 11:30 a.m. Interment will be in the Richmond City Cemetery. There is not a whole lot to report on at the present. We enjoyed a Thanksgiving here in blessed Virginia. Amanda and I drove to Massanutten, a resort up in the hills. We went up to spend Thanksgiving with Amanda’s Uncle and Aunt. It turned out to be an interesting day. I enjoyed the drive up to the area. Gordonsville was the highlight of the day, the town having a personality completely its own. A rare thing it seems these days. Massanutten wasn’t anything to boast about. They do have a very large indoor water park. Other than that, it was just a bunch of condos in the middle of the mountains. Don’t get me wrong, the mountains were beautiful. How much more beautiful without the “hello, here I am” presence of the resort? Amanda and I have determined we will never go out to enjoy our Thanksgiving meal again. It seems to undermine what the day is about. Who would have ever thought it was Thanksgiving. Where was any resemblance of Thanksgiving, other than a commercial version of the foods associated with the date? We went back and pretty much watched the TV for the rest of the day. Driving home, we were relieved to leave the situation which seemed lacking so much. Hopefully, I can pay some homage to the day here even though the day did not provide much. This week, I discovered I am the posterity of individuals who lived at Jamestown. Yes, next years celebration of 400 years in America, honored even by the Queen, is directly relevant to me. Not just through this nation, but through my ancestors who lived there. The Clark (or Clarke) family, the Summers, Lumpkin, and Thompson groups I am all related to. There is a possibility my Clark’s even come from the famous John Clark, who was the Master’s Mate on the Mayflower. He had been to Jamestown before, imprisoned in Spain, made the trip of the Mayflower, and eventually made his way back to live in Jamestown. He died not too much afterwards. I am also a descendent of the Graham Clan who settled parts of Virginia, West Virginia, and Kentucky. They extended into Missouri, Indiana, Iowa, and Ohio as well. I am an American very deep in some roots. One of those Grahams was a personal friend of George Washington, and convinced him to help endow a new school he had founded. Yep, a Graham founded Washington and Lee. My history includes three future presidents, universities, and other numerous recorded aids to society. My roots expand the ocean many times. My roots run to Wales, Ireland, Scotland, and England. My ancestors were in the court of rulers; my ancestors even ruled parts of the Roman Empire. My ancestors come from Sweden, Norway, and the largest number from Germany. I have family who can be traced into Russia, Australia, and a score of other nations. The foundations I have been given are broad and inclusive. I am so very fortunate. Each of us have a history which began long before we were born. Those blessings extend beyond my family. This nation, which has its hopes in liberty and freedom are one of the greatest blessings to me. I am very fortunate. It may be a weakness in many ways, but is a great boon in many more ways. I pray for the principles upon which it is founded to continue to go to the whole earth. I pray that those principles would be grasped by other nations and be implemented into their states. I pray our nation might return to the principles of truth and freedom for which it is founded. I remember the lives of those who were given for this freedom I enjoy and others do not. Two of my Great Grandfather’s were gassed in WWI and both lived to tell the tale. Both met painful and difficult deaths due to it. One grandfather has purple hearts to show for his wounds and success in WWII. The other grandfather tried to enroll, but due to health issues was not allowed to be a part. I pray for the soldiers of freedom everywhere. I care not what nation they represent, as long as they are there for liberty, freedom, and truth. I pray God will bless those who represent those hopes and ideals. That those who do not represent those ideals, or those they represent, will be thwarted in their designs. It is with gratitude I offer my thanks to He who makes death not a fear. I thank and give adoration to the Savior of all mankind, even Christ that we might all live again. That despite wickedness and fear, we have nothing to fear but sin. I express my deepest thanks for the restoration of His church back on the earth and the miracles which abound about us. The gathering of lost nations, the restoration of Israel, the building up of the kingdom in preparation for the king whose right it is to rule. My deepest sympathies are with the restoration and furthering of eternal purposes upon the earth. My greatest joys and delight come from this impressive, yet almost unrecognizable effort happening in our midst. I am pleased to have been born at this time of such great blessing. It is with a certain hope I see the future, despite all which is prophesied to come upon us. So much pain that the Saints will barely escape with their lives. We have seen little or nothing of what is to come. Nations will rise up against nations and desolation shall abound on all the earth. Those of the order of God have not need to fear though. This I am grateful for. For the Priesthood which shall protect those within the covert from the storm, for the Resurrection that those who will be lost; both for their own sins and for a more full judgment upon the wicked. Most close to home I thank for those who are dearest to me. I am thankful for those who so deeply touch the deepest parts of my soul. Many who are now separated from me by death, but that too shall not be for long. My dearest wife, and all her splendor for which I am a blessed soul. My parents who fought and struggled so hard for my upbringing and their abiding love for me. There is a whole multitude of souls I could reference for their influence in my life. The more I learn and contemplate, the more I realize how intricately every soul is linked to one another. Even years later we remember the influence of another. There are influences from childhood, influences from events far away, and even influence from beyond the grave. My heart is full. I am thankful for all things. We have safely arrived at our home in Glen Allen (Richmond) Virginia. We have now unloaded the car and are in the process of putting things away. Here in a while we will venture out to find food, tp (how rude to not leave any! ), and find our way around some. It will surely be an adventure as we have no idea where anything is. Today we left from Lexington, Virginia and drove here. Last night we spent the evening with Evan and Amber Fetters. They are friends of mine from USU. They were the ones I visited last year in Baltimore, and we both keep crossing the country. They took us on a little tour of Lexington. I have to admit, it is such a beautiful town. It has its character and maintains it. I have to admit, I am leaning towards Washington and Lee University just as much as University of Virginia. I loved it there. We drove from Mt. Sterling, Kentucky yesterday. West Virginia was beautiful. We liked the gold domed capitol building. Nothing too exciting other than that we jumped off of I-64 to skip the turnpike. Since we are thrifty we decided we don’t like toll roads. We took US-60 through some pretty serious back country. It was very beautiful and added a few hours onto our trip. The day before we drove for over 11 hours. We drove from Branson through St. Louis, Illinois, Indiana, and northern Kentucky. It was beautiful. Anyhow, time to get back to work. We have a house to organize.